These portions are for a starter or light lunch or supper, for a larger meal just increase the quantities. Start the slaw. Slice the cabbages into fine shreds with a sharp knife (or use a mandolin) and put separately into two bowls. Mix the juice of half a lime, half a teaspoon of salt and half a teaspoon of sugar into each bowl, mix and leave to macerate (pickle) for 1 hour. After this time squeeze the cabbages to remove excess liquid then combine in a single bowl and mix in the other ingredients. Slice the lettuce very finely, just before serving mix into the cabbage. Make the sauce. Rinse the capers and squeeze out excess salt. Chop finely and put into a bowl. Add the other ingredients to the capers and mix well. Taste and adjust seasoning. Prepare the avocado, chilli and coriander. Cut the avocados into chunks, slice the chillies and chop the coriander and set each aside separately. Cook the fish. Heat about 150ml of oil in a large frying pan or wok. Put the flour in a wide bowl and beat the eggs in another bowl. Skin and chop the fish into chunks about 20g each. Dip half the fish in the flour. Then dip in the egg and place on a large plate, take the plate to the frying pan and carefully and quickly add each piece to the oil. Fry until the egg batter is golden and crisp and the fish is cooked. Drain on a rack over an oven tray, or on kitchen towel on a plate. Place in a low oven to keep warm, Repeat with the remainder of the fish. Assemble and serve the tacos. Heat a cast iron pan or frying pan until hot. Cook the tortillas, briefly on both sides until lightly browned and hot. Stack inside tinfoil and keep in a warm place. To assemble, add the slaw to the tortilla, top each tortilla with a couple pieces of fish, add 1/4 avocado to each taco drizzle over the sauce and garnish with chilli and coriander. 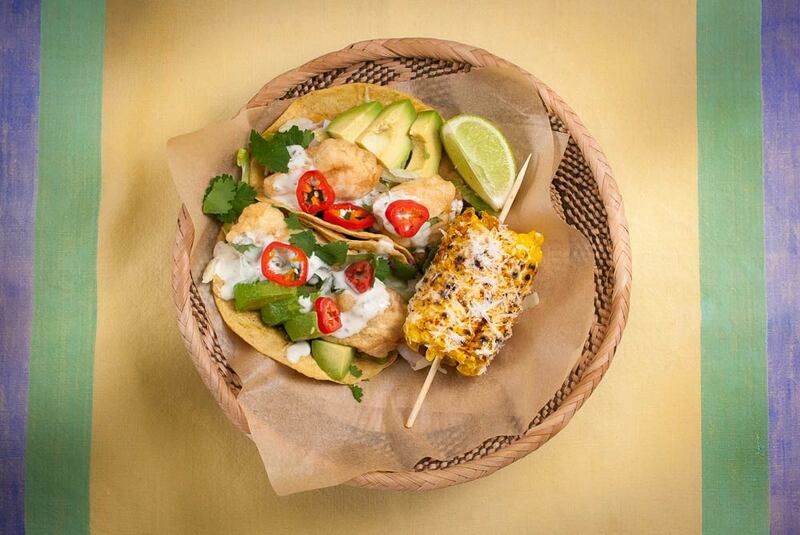 Serve two tacos for each person with a wedge of lime and the corn.